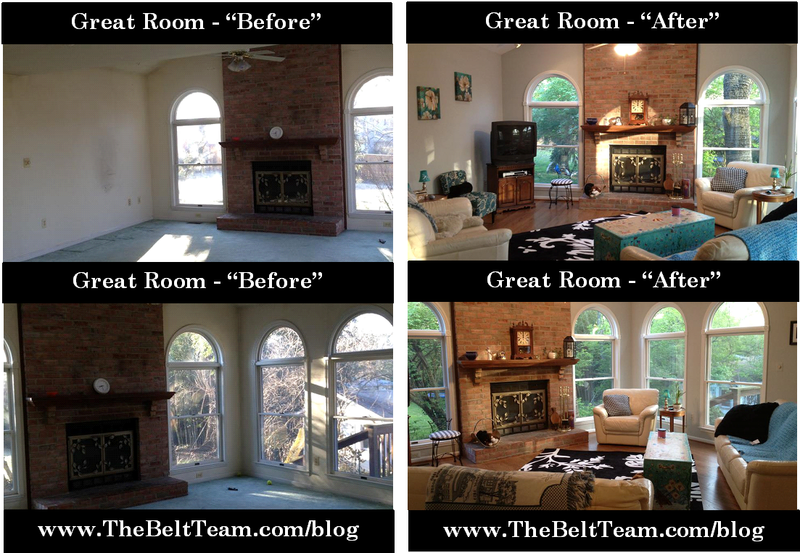 I recently wrote a post called “Love It Or List It” and gave you a peek at the home renovation we did last year. I am thrilled with how it came out. But it wasn’t always a walk in the park. So today I’m going to share my “6 Secrets To Surviving A Home Renovation”. First – let me give you an idea of the work we had done. We had our house built in 1986. We had been married 2 years at the time and we were SO excited to move from our condo to our new single family home. We spent hours talking about all the details. (Well “we” didn’t, but “I” did. LOL!) The carpet color, the tile selections, the window treatments & the wallpaper. Yes, the wallpaper. 1. Hire a contractor who does what he says he’s going to do. They all talk a good game. But they all don’t do what they say they’re going to do. Last year, I had a client call to ask for a contractor recommendation. Unfortunately, she called AFTER she was 8 months into what should have been an 8 week renovation. She was tens of thousands over budget and not happy. This could have been prevented if she had done her home work. Don’t just interview the contractor. Interview past clients. And not just the ones he gives you to talk to. Ask them who else they know who has had work done by this contractor. And then ask those people too. And don’t just talk to them. GO VISIT THEM! You might be surprised at what people will tell you. Even the ones the contractor “thinks” are giving him glowing reviews. In our case, we hired a builder (Dominion Associates inc) that we have represented for more than 20 years. He builds million dollar homes that we list and sell. And so I already knew that he does what he says he’s going to do. 2. Ask for a “worst case timeframe”. The temptation is to just ask “how long will it take?”. But what I found is that there will come a time where you just want it to be done and each day after that can be excruciating. So instead, ask “How long would you guesstimate and what’s the worst case scenario?” Then, prepare yourself as if the worst case is the best case. In my situation, the builder said 6 weeks was worst case. I prepared for that. And it was done faster. That meant happy builder (because I wasn’t “pushing” him) and happy client (because he exceeded my expectations). Things are bound to go wrong. It’s just part of the process. But if you keep your sense of humor and can laugh about it, it makes the process a whole lot easier. 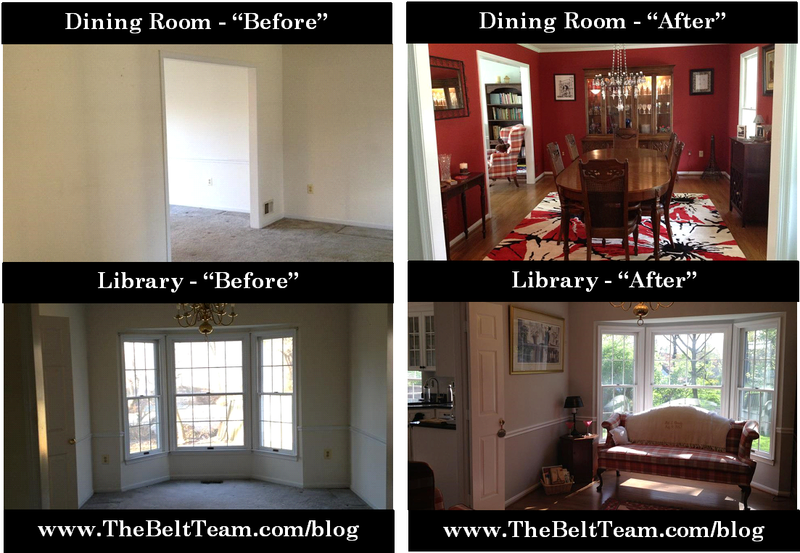 What went wrong during our renovation? Not much. It took 3 tries to get a refrigerator delivered without damage. 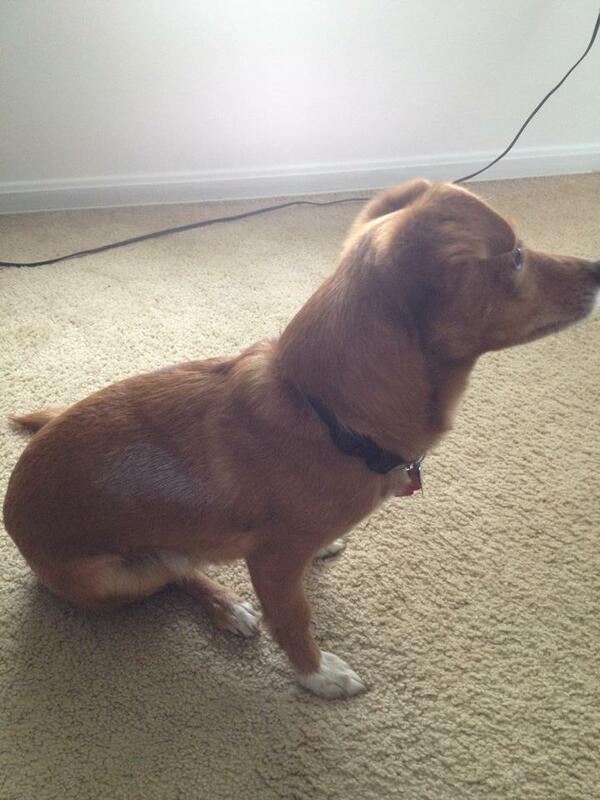 Oh – and one day our dog got painted. I work out of a home office most of the time. And we have a finished basement. So I was insistent that we could stay in the house during the renovation. We also have a dog. So it wasn’t easy to find a place to move to for 6 weeks. But if I had to do it all over again, I would at least have moved out for a few weeks. (Perhaps then Cody would not have gotten painted!) The worst times to be there were during the sanding of the hardwood floors and the painting. I have asthma and it was triggered badly by both of these events. When you’re doing a renovation project like this, it’s easy to get caught up in both the big & little choices you have to make. After all, this is probably something you’ve been dreaming about for quite some time and you want to make sure it comes out exactly right. I spent hours and hours and hours looking online, stopping in to look at granite samples & more. What color granite? What about the backsplash? Would that faucet work? What about the hardware on the cabinets? Horizontal or Vertical? Black or Silver? And the list goes on. 6. Pare down, purge, and prepare for dust. No matter how good your contractors are at cleaning up after themselves and no matter how well they prepare the site to contain the dust (and our contractors were meticulous! ), it will invade every surface and every crevice. Every singe item you pack away will need to be washed or cleaned when you unpack it post-renovation. We carefully packed all our belongings and moved them to either the basement or the garage. Everything was covered, sealed & protected as well as it could be. After 25 years, we had a lot of “stuff”. So we purged as we went. But looking back, we could have pared down even more. There comes a point when you are packing where you find yourself just packing everything, because it seems like you will never finish the task. When you hit this point, I encourage you to KEEP PURGING! If you don’t, you’ll find yourself unpacking after the renovation and taking things out of boxes that don’t have a home any more. Because once your renovation is done, and your home looks spotless & beautiful, you are even more incented to keep it looking that way. So instead of taking the time to wrap things, box them up, carry them to storage, carry them back from storage and unpack them; only to wonder why you kept them in the first place, do it right the first time and PURGE, PURGE, PURGE! And remind yourself that every single item will have to be washed, cleaned or dusted. That includes clothing (even though our closets were sealed), furniture (even though it was in the garage) and every boxed up item like plates, glassware, photos, cd’s, books, etc (even though they were in the basement). 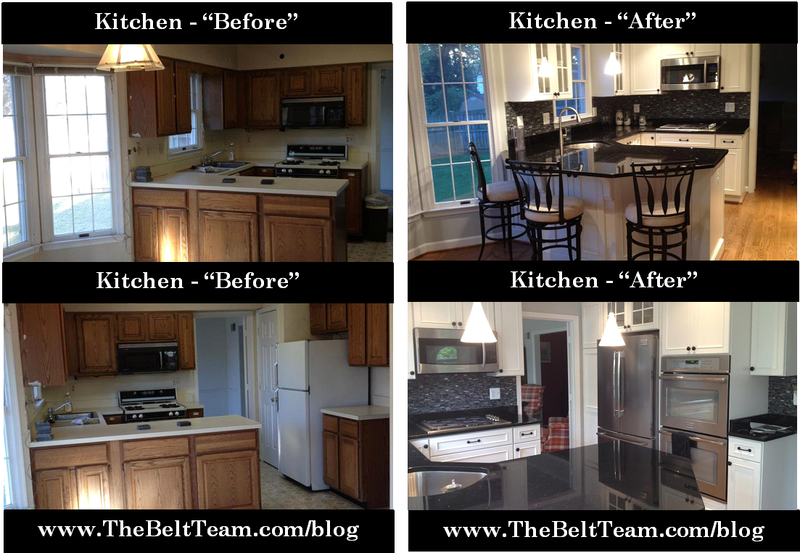 There are a lot more things to consider when renovating, especially if you’re debating renovating versus selling, so please give The Belt Team a call at (703) 242-3975 (or email us). We’re happy to share our expertise about resale value, contractor recommendations, etc!